I had spent a long time reading about Komodo as a diving destination and watching underwater footage of the reefs and colourful diverse marine life in the area. 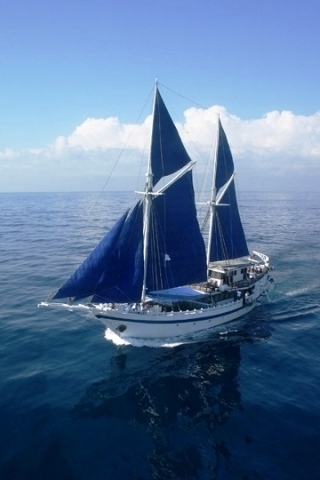 I had also never been on any of the Peter A. Hughes' liveaboards so when the chance came to take a trip to Indonesia on the Komodo Dancer (now called the Indo Aggressor) I was very excited. Being part of a franchise that caters to the demands of US customers means that with a Peter A. Hughes operation you can expect a high level of service and efficiency. So I suppose it was not surprising when the minibus arrived at my Bali hotel to collect me exactly on time. My first impression of the boat was very good. 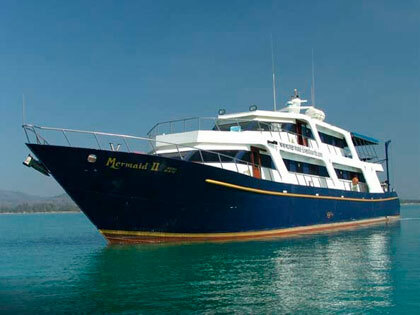 I am more accustomed to the type of boats that operate in Thailand, which are mostly motor vessels with steel hulls. 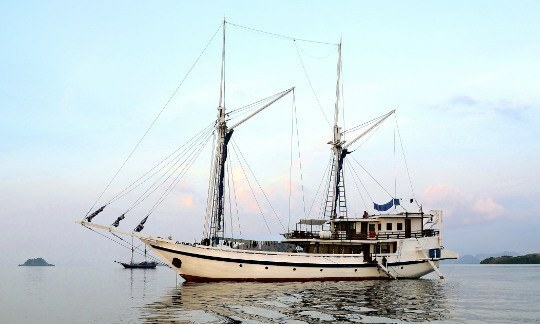 However, when we arrived at Benoa Harbour and hopped out of the minibus, my eyes were greeted by the impressive sight of a tall, proud Phinisi schooner, an Indonesian yacht, which looked fantastic. 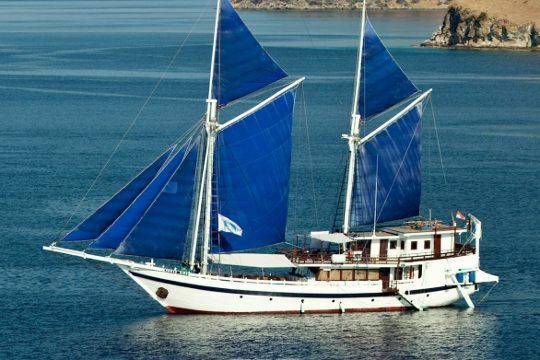 I like the speed and efficiency of the motor vessels but there is something romantic about cruising around the remote islands of Indonesia on board a local sailing ship. Sailing is what we did on day 1, with our first dive the following day at Satonda. Guido, a friendly and enthusiastic Dutchman (and the boss) welcomed us all on board at the harbour and assured us our every need would be catered to. He was certainly not wrong. We did not have to lift our gear once as the local crew was very attentive and always smiling. Leaving Benoa Harbour in Bali behind, we headed east. Initially we had to manoeuvre out of the busy harbour and Bali waterways, but little by little we left the pleasure boats behind as we ploughed through the aquamarine waves, towards our destination. As we settled in to our trip and had a look around I noticed how much space there is on the Komodo Dancer. Since I have been on board they have added 1 more cabin but there is still quite a lot of space to relax in, both inside and out. 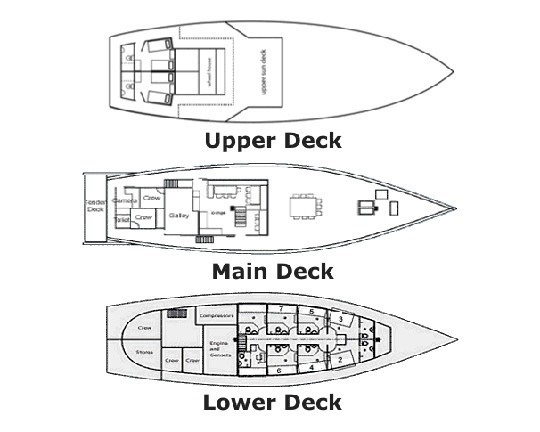 The main deck has a table for 14 people, storage for all the equipment and still has enough room to sit and relax. The upper deck has more teak sunchairs than there are guests, and there are shaded areas in which to simply relax or enjoy a massage. The cabins are comfortable with good bedding and there is a good toilet and hot shower. The saloon is huge with 2 areas, 1 with tables and 1 with sofas. A very complete library is available with not only books but also encyclopedias. So whether you want to sunbathe, relax, or read there is the perfect place for you. However it was the scuba diving as I was looking forward to most and I was not disappointed. The guides were excellent and really knew the dive sites well. They were always looking to find the small and less obvious creatures and were keen to make sure that everyone got the most from the sites. 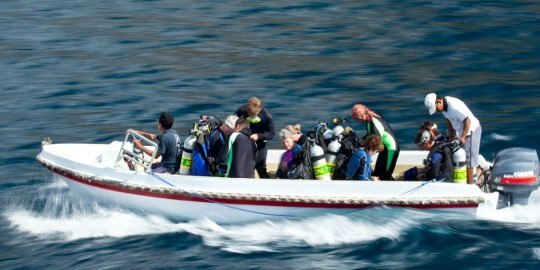 I was impressed with the 'safety first' approach of the staff of the Komodo Dancer liveaboard. Of the 3 DMs there were always 2 in the water and 1 on deck, keeping an eye out for the group. Importantly every single diver is given a personal radio beacon (attached to their equipment) just in case! We also had a long and detailed safety briefing on arrival so everybody knew how to avoid problems and what to do if something did go wrong. These measures combine to provide an extra sense of security which made the group very relaxed and stress-free. Before every dive we simply had to wear our wetsuits and take our masks; all the hard work was done for us. After each dive we no sooner stepped back on the deck than we were greeted with warm towels; a very nice touch since the water can sometimes get a little cool in the Komodo National Park. Underwater we saw lots of action. Generally the reefs were in excellent condition and very colourful. There were plenty of schools of fish around as well as sharks and mantas so I was very happy. My favourite dives were at Cannibal Rock, Gili Lawa and GPS Point. Volcano was also worthy of mention since we dived over black sand and bubbles rose from the sea floor. Generally the sites in the park itself were much more impressive than those outside but visibility was pretty good throughout. 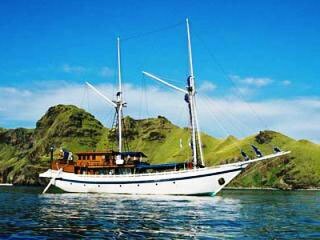 One of the best things was that we were often diving in spots where the Komodo Dancer was the only boat around. That really added to the pioneer feeling of remoteness on the tour. In between dives the crew of 15 (in addition to the DMs) were at all times professional and well trained. The Indonesian crew members speak some English. Sebastian the main steward speaks English, French, Italian, German. He's always in the saloon serving the food and taking care of guests. One of his most important jobs is opening the bar at 17:00 - great cocktails! The diving crew is very professional. The Indonesian DM (Wayan) speaks good English. Onno is the Cruise Director (Dutch) and Carine his wife is the second instructor (she's a professional photographer) They speak English, French, Dutch and Indonesian. So you are likely to always find someone who you can chat easily to. All the staff are very friendly and give personal attention to the guests (birthdays and marriage celebrations get cake and songs!) 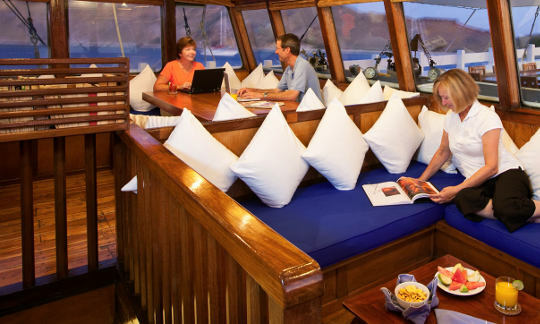 The training of the staff and the high level of service they provide, are elements of the cruise that the Komodo Dancer can correctly claim set them apart from many of the other local liveaboards. Food is always high on the list of importance with liveaboard customers and the food on this dive trip did not disappoint. Even the vegetarians were happy. Before going off to sleep you can make sure the day starts well by pre-ordering a hot drink in the morning. It is very pleasant when someone taps on your door to wake you up with a steaming hot chocolate! Breakfast is always plentiful with eggs, muesli, sausages, bread and pancakes. A buffet style lunch is a great mix of Asian and international cuisine, always with lots of choice: vegetables, fish burgers, salads, and curries. For those who like to nibble, there are little snacks throughout the day such as cookies, cake and slices of fresh tropical fruit. Cocktails from 5pm are the highlight for many, when they unwind and discuss the day's diving. So after days of excellent diving, great service, good food and fruity cocktails, the cruise sadly came to an end. The impressive treatment of guests continued right down to the transfers where there was 1 minibus for each destination. I was the only guest going direct to the airport and had a minibus to myself. 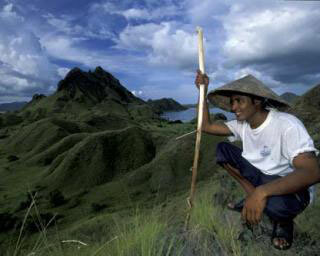 So from the first welcome to the last goodbye, I was really well looked after by Komodo Dancer. I had some excellent dives and met some very friendly people, and all the time I was treated like a VIP.